In 2015, KETV-TV, Channel 7, the ABC affiliate in Omaha, moved into the Burlington Station building on South 13th St. The move was much anticipated and was an example of the revitalization of an overlooked part of Omaha. The Burlington Station was built in 1898 and was used as an Amtrak station before it closed in 1974. The building fell into disrepair and was destined for demolition before KETV decided it would be an ideal location for their television station. The restoration and renovation was completed in 2015 and the ABC affiliate does all production and broadcasts from the location. See before and after photos of the space here. 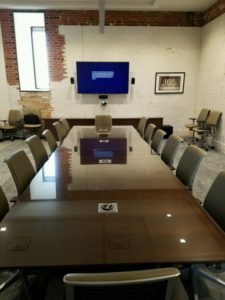 Quality Glass & Mirror was recently approached by the station to produce and install glass tops for their oversized conference room table and credenza. Glass was their preference because it would mirror the open feel of the lobby and entryway while protecting the table surfaces. We created a custom glass table top that measured 192” x 60” using ¼” clear tempered glass. 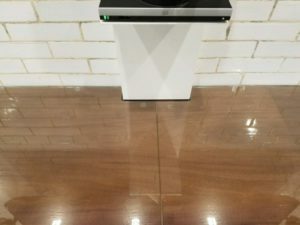 The glass top is split into two sections, has flat polished edges and contains four cutouts measuring 6 ¼ x 6 ¼’ to allow for data connections in their cutting edge conference room. The plans included a glass top measuring 150 x 25 ½” for the credenza. 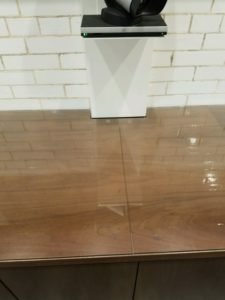 ¼” clear tempered glass with flat polished edges was used for the custom top as well. The glass is split into two pieces with two notches where the glass butts together to allow for a perfect fit. 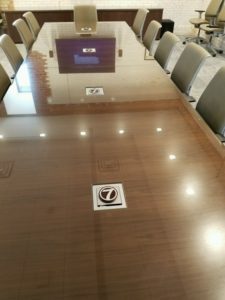 In addition to the two pieces for the conference room, we produced a 48” diameter glass top for one of the tables located in the lower level common area. The table needed protecting from cameras and heavier equipment being placed on the table and the glass top is the perfect choice. Quality Glass & Mirror in the News!